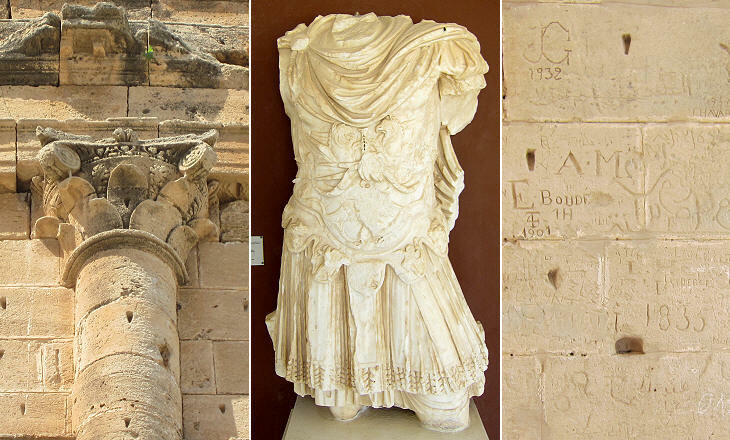 Here we have several antiquities as altars with defaced inscriptions, a variety of columns, a great many trunks and arms of marble statues one of which is of the Coloss kind in armour, another is of a naked Venus in the posture and dimensions of the Medicean, both of them by good masters, but the heads are wanting. 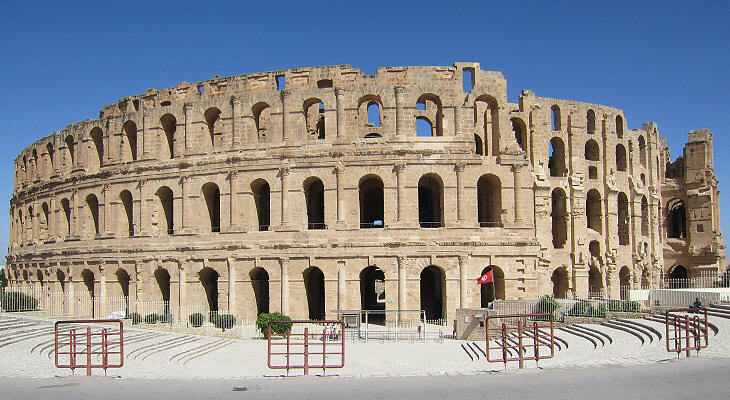 But Jemme (Thysdrus/El Djem) is the most remarkably distinguished by the beautiful remains of a spacious amphitheatre which consisted originally of sixty four arches and four orders of columns placed one above another. The upper order which was perhaps an Attic building is most of it tumbled down. Mahomet Bey likewise in a late revolt of the Arabs who used it as a fortress blew up four of its arches from top to bottom, otherwise as to the outside at least nothing can be more entire and magnificent. From Travels or Observations relating to several parts of Barbary and the Levant by Thomas Shaw - 1808. The 1895 Murray handbook for travellers in Tunisia and Algeria gave this description of the landscape surrounding ancient Thysdrus: (Beyond Sousse) the olive trees cease, and the traveller enters a wide and treeless plain, part of the district called Es-Sahel, or coast region — extremely fertile when an unusual quantity of rain has fallen, but at other times almost uncultivated, and apparently hardly susceptible of cultivation. Today one sees some olive groves around modern El-Djem, but they are not comparable with the vast plantations which made Thysdrus an extremely wealthy town in the IInd century AD. 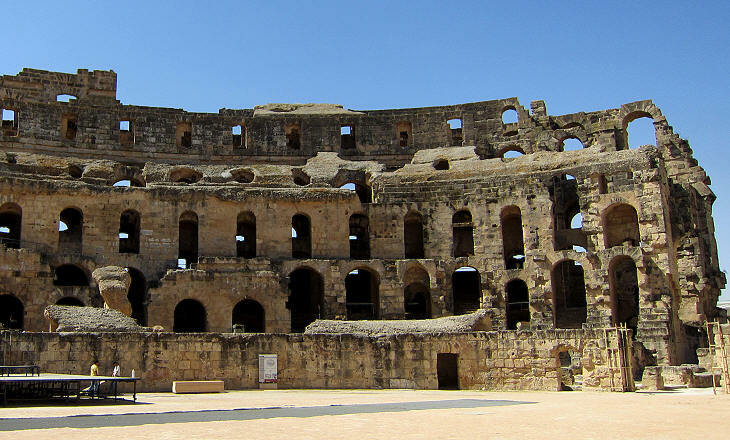 The construction of the amphitheatre was started towards the end of the IInd century and probably its decoration was not yet completed in 238, a crucial year in the history of Thysdrus. In 235 Emperor Alexander Severus was assassinated in Germany during a rebellion of soldiers headed by Maximinus Thrax, the commander of the Roman army on the Rhine border. Alexander Severus was the last of his dynasty which was founded by Septimius Severus, a native of Leptis Magna, a port in today's Lybia, which was part of the Province of Africa. The Severian emperors helped the development of their homeland by granting fiscal exemptions which were revoked by Maximinus. In 238 the rich landowners of Thysdrus promoted a revolt against Maximinus, but this was quelled by Legio III Augusta, the legion stationed in Africa and Thysdrus was punished for its role in it (more on 238 the Year of the Six Emperors) and its amphitheatre was not completed. 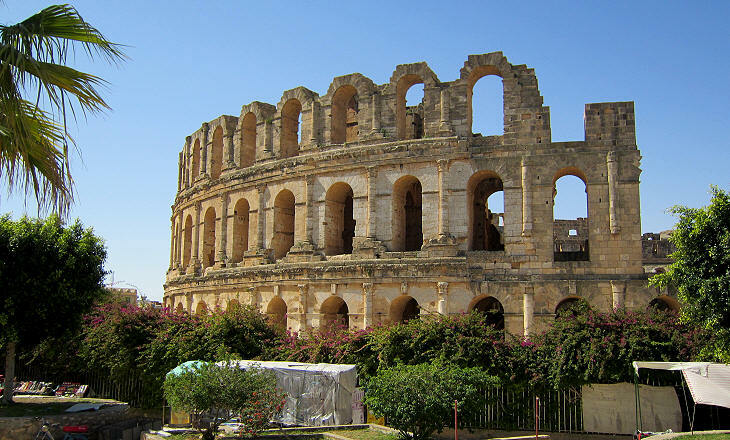 Similar to the Colosseum of Rome and to the theatre of Bosra, the amphitheatre was turned into a fortress where local tribes tried to check the Arab invasion of the region after the Byzantines had been defeated at Sufetula in 647. In 670 the Arabs founded Kairouan, forty miles north of Thysdrus, and made it the capital of the country. This fact, associated with the arrival of Arab nomadic tribes which led to the abandonment of farming, caused the decline of Thysdrus. In 1695 some breaches were opened in the northern part of the amphitheatre to prevent it being used as a fortress again. This led to its becoming a quarry for the construction of a village. 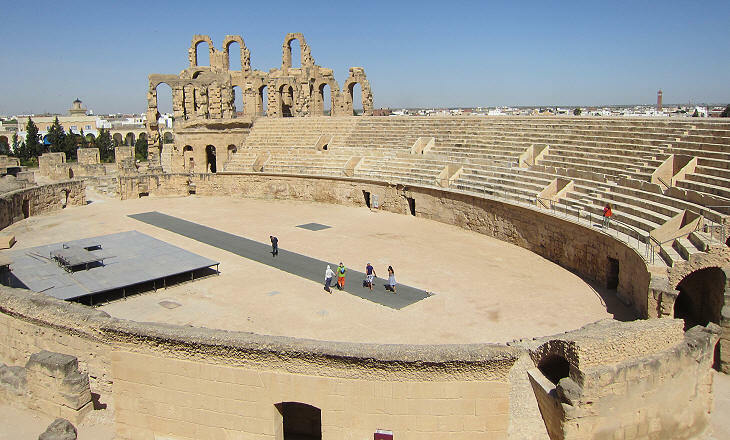 Today the amphitheatre is a main attraction for the holidaymakers of the nearby coastal resorts at Sousse, Monastir and Mahdia, even more so after UNESCO included it in the World Heritage List - external link in 1979. Part of the arena has been rebuilt to house a yearly music festival. 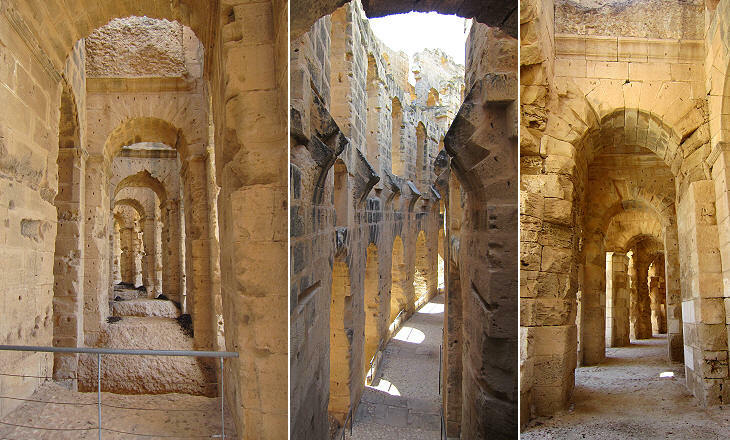 There is little of interest at El-Djem, save its amphitheatre, which may be said to be all that remains to mark the site of the ancient city of Thysdrus, or Thysdritana Colonia. The modern village is built entirely from its ruins, and all that is visible of the city itself are a few foundations and tombs towards the N.W. The only other remaining monument of Thysdrus, with the exception of the House of Africa, is an older amphitheatre which was located to the south of the main one. Its size does not appear to have been small and it is believed it could seat an audience of 8,000, so the construction of the new one was motivated by the desire to show the wealth of the town, rather than by actual need. 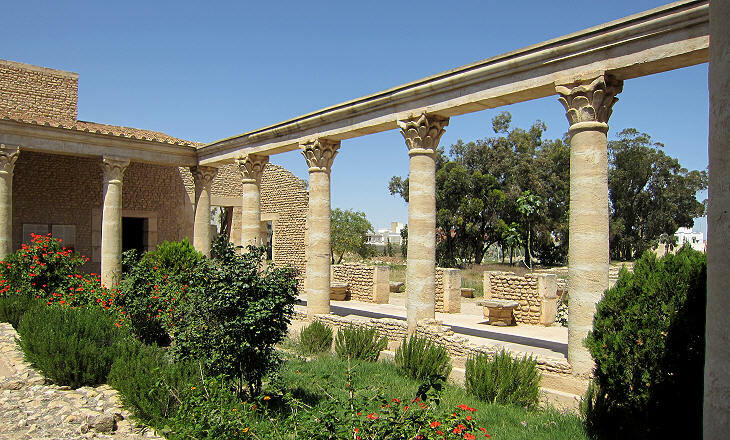 The ticket which allows access to the amphitheatre is valid for visiting the Archaeological Museum of El-Djem which is located near the reconstructed premises of the House of Africa, a Roman house uncovered in the outskirts of the modern town. 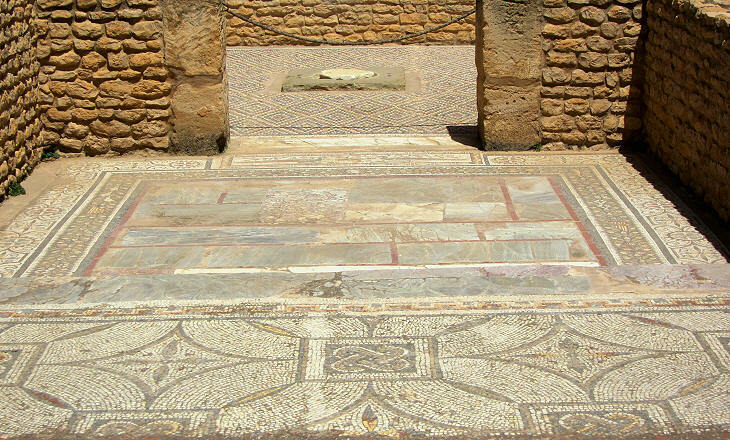 It is named after two mosaics portraying the Province of Africa, one of which is shown in the introductory page. The image used as background for this page shows a mosaic of the House of Africa portraying Venus swimming in a shell.